I have been creating healthy recipes for this blog for a while now, so I thought I would have a bit of fun and enter a recipe competition. Kohana sent me a bottle of their cold brew coffee concentrate with one instruction – create something delicious. Because I already have my morning coffee routine perfected (and I am a serious creature of habit), I had to think of some other time of day when coffee would appeal. That’s when it struck me. The witching hour. That hour in the afternoon when exhaustion strikes. When all you want to do is lie in a hammock and snooze. I avoid drinking coffee that late in the day for fear of it messing with my precious sleep. 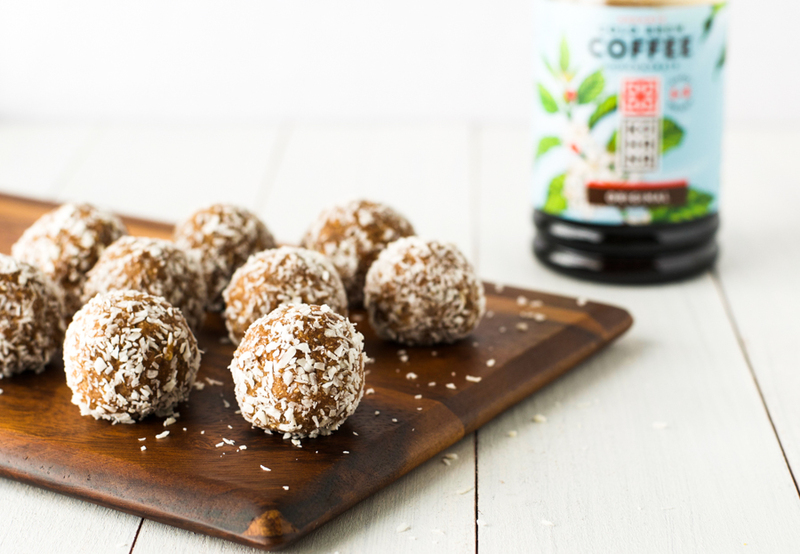 And so I came up with the perfect alternative… these Kohana coffee energy bites. 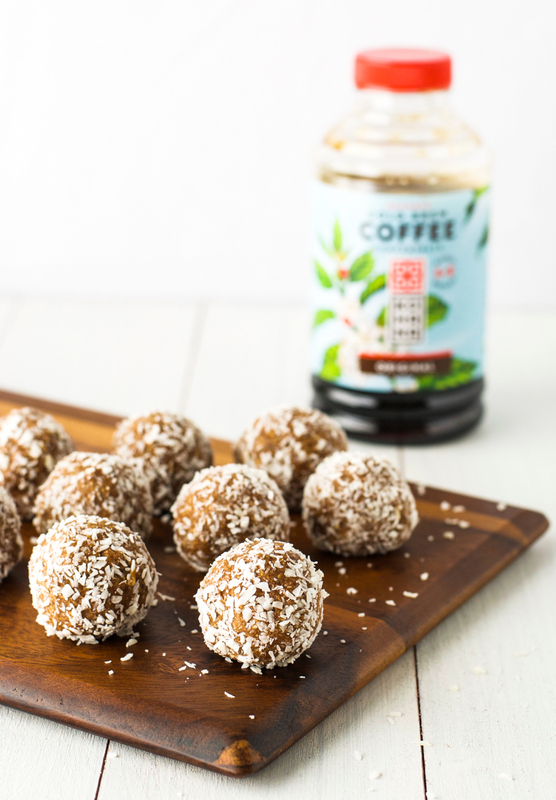 These coffee energy bites have a little hit of caffeine to help you get through the afternoon. But unlike a regular cup of coffee, they also contain 6 grams of fiber (1/4 of a woman’s daily needs), 7 grams of protein, and 10% of your daily iron requirement per ball. You can get yourself out of your afternoon slump, reach your daily fiber quota, and enjoy a sweet treat all in one delicious 200-calorie bite that only takes 15 minutes to prepare. So what are you waiting for? I suggest you go make some immediately. 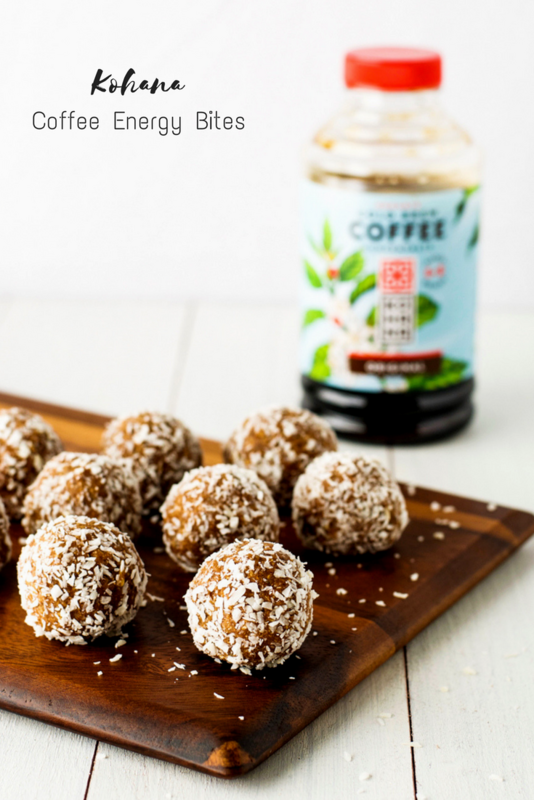 And if you have a minute to vote for my coffee energy bites you can click here and know that I will be eternally grateful. Put the oats and coconut in a blender and blend until fine. In a large bowl, mash the banana. Add the oats and coconut, coffee, almond butter, cocoa powder, chia seeds, and maple syrup. Roll into golf ball sized balls. Roll each ball in the additional coconut. Refrigerate in an airtight container for up to one week. These look like they would be a great pick-me-up snack! You know, every morning I allow myself two cups of coffee. Come afternoon I resist making and drinking two more, but boy do I want them! 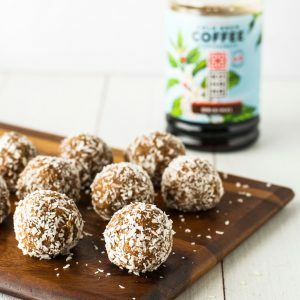 Your energy balls look like the perfect solution, and I love that their filled with such good-for-us ingredients! Thank you. On another note, I’ve experimented with at least a dozen ways to get trustworthy nutrition data for my recipes, but have yet to find a way to generate a form I can feel confident is accurate and that I’m also sure doesn’t violate intellectual property rights. I’ll understand completely if you’d rather not share your source, but if you’re comfortable with it, would you be willing to share what you use to generate your nutrition data? Thank you for your comment Kathryn. I hope you like the energy bites if you make them 🙂 As for nutrition analysis, I use a computer program available to me through my college where I am studying for my Masters in Nutrition (Food Processor). It is a very good program. However, there are always limitations when calculating nutrition information for a recipe. The actual nutrient content varies depending on the precise ingredients you use. I might use a vegetable broth with 100 mg sodium per cup, you might use one with 200 mg. We just don’t know. You can get a pretty good idea of nutrient content by using My Fitness Pal and adding your own recipe manually. It gives you the option to select specific versions of each ingredient. That way you can use your judgment and try to find the most commonly used version of an ingredient. I often cross refer my nutrition content results with the National Nutrient Database as well. It is not a perfect science, but if you use some good sources and your own common sense and judgment, you can get a pretty good estimate. These little morsels sound not only tasty but healthy. I love the combination of ingredients with the coconut, banana, almond butter, chia seeds and coffee. Sounds great for an afternoon pick me up or anytime of the day. Sharing on tweeter and pinning. Congratulations on being featured on Healthy Living Link up. Have a healthy happy & blessed Easter.